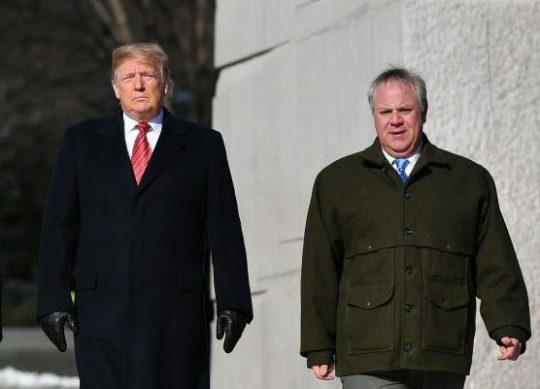 President Donald Trump annouced Monday he plans to nominate David Bernhardt to lead the Department of the Interior. Bernhardt, who previously served as the department's number-two official, has served as acting secretary since Ryan Zinke stepped down from the post in December. "I am pleased to announce that David Bernhardt, Acting Secretary of the Interior, will be nominated as Secretary of the Interior," Trump tweeted. "David has done a fantastic job from the day he arrived, and we look forward to having his nomination officially confirmed!" Bernhardt is a hunter and fisherman who has served on Virginia's Board of Game and Inland Fisheries and as the United States Commissioner to the International Boundary Commission, U.S. and Canada. Between 2001 and 2009, he served in various capacities in the Department of the Interior. Immediately prior to his nomination as deputy secretary in 2017, Bernhardt chaired the natural resource law practice of Brownstein, Hyatt Farber and Schreck, LLP. As an attorney, Bernhardt's clients included oil companies, including Noble Energy and Halliburton. Sens. Cory Gardner (R., Colo.) and Lisa Murkowski (R., Alaska) expressed support for Bernhardt in the wake of his confirmation as deputy secretary. A fellow Coloradan, Gardner said Bernhardt "has a deep understanding of Western land issues." "He understands the management of federal lands … and the balance between conservation and development," Murkowski said of Bernhardt. Zinke resigned as secretary in December as he faced pressure stemming from several investigations regarding real estate dealings and conduct. He ascribed his departure to "vicious and politically motivated attacks." This entry was posted in Politics and tagged Department of the Interior, Ryan Zinke. Bookmark the permalink.